Always providing the ultimate gifting suite, Secret Room Events Academy Awards Style Lounge 2012 was held at the L’Ermitage Hotel in Beverly Hills. 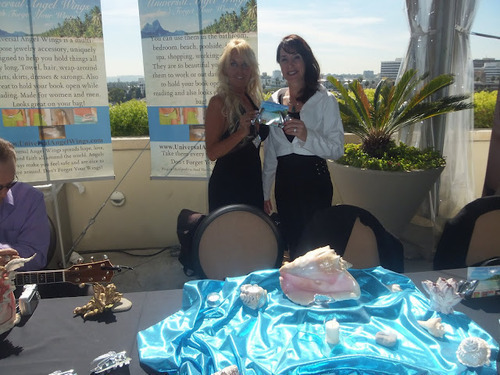 Another glorious day in Los Angeles, guests were able to enjoy a room full of phenomenal products ranging from spa treatments at home to VIP trips to Turtle Beach in Fiji, while taking in the breath taking views and weather of Los Angeles. Who doesn’t enjoy a classic dish of macaroni and cheese? The Comfort Gourmet put their spin on this classic, and guests were able to indulge in the decadent mac and cheese on site. More than your average cup this company ups the bar and adds a variety of veggies and a combination of cheeses to stand out from the rest. Trust me when I say, your taste buds will thank you later. The Comfort Gourmet is available at a variety of markets in the Los Angeles area such as: Gelsons, Bristol Farms, Whole Foods and many more. Universal Angel Wings is a multi-purpose jewelry accessory. With this cute little accessory you are able to hold your beach towel, hair, hold your book open and so much more. Spreading love, joy, hope, and faith, Universal Angel Wings, is the best pocket size accessory to take to a day at the beach or your everyday life. Giavannas Closet brought the cutest outfits for the younger generation. Complete with headbands and barrettes, who said there was ever a certain age you had to be in order to be fashionable. Giavannas Closet is a chic boutique for high end baby clothes composed of lace and chiffon petti skirts, rompers, hair accessories and more. With all of the photo opportunities for Academy Awards weekend, we all could use an extra boost of whitening for our teeth! 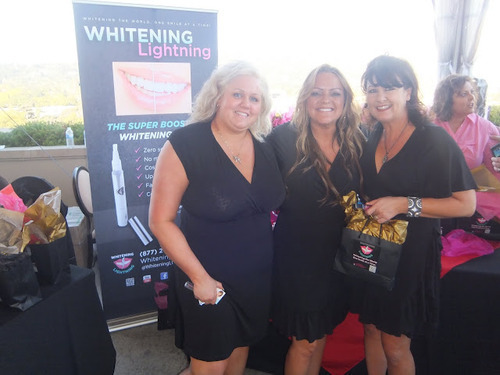 Whitening Lightning brought a couple solutions to fix the problem. The super boost whitening pen dissolves difficult to remove stains without any damage to the tooth enamel. You simply apply it morning and night for superior results. Whiter teeth are just a few clicks away. Dial A Smile Professional Whitening Kit is a professional at home whitening system, which provides the same service as going to a professional but without the hefty price tag. The best of the best in skin care, the products at Atzen do exactly what they say they are going to do. Using unique formulations that are composed of high concentrations of ingredients such as INTACT, DNA, peptides, and ATP (energy) while using natural ingredients such as: green tea, coconut, and olives, Atzen, is an all-natural product that proves to be beneficial to your skin. Beginning more than a century ago, Pantofola d’Oro has been known to serve the world’s greatest athletes and champions have grown into a world of iconic Italian heritage and style. This unique and stylish sporty sneaker is made with the same quality, craftsmanship, and style as they were in Italy. Composed of soft and luxurious materials, Pantofola d’Oro has the perfect mix of components for your every need and want in a shoe. I scream, you scream, we all scream for ice cream! Beachy Cream Ice Cream served all in attendance rich ice cream sandwiches. 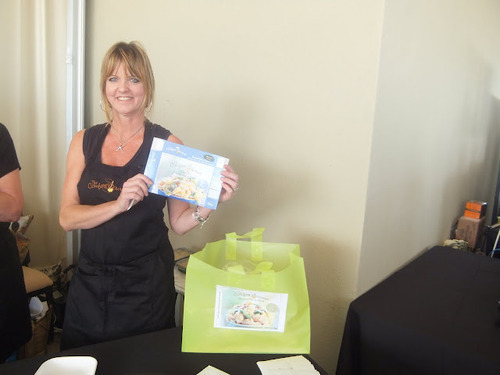 Malibu’s Natural Ice Cream Sandwich, Beachy Cream, is a portable ice cream shoppe that sweetens up any event. These ice cream sandwiches come in an array of flavors such as: key lime cowabunga, strawberry surfer girl, and ginger wipe out-just to name a few. The ice cream sandwiches will change your outlook on ice cream and have you coming back for more. Designed by Lorena Ponis, Lolo Jewelry, is known for its glamorous, classic, and effortless style. Lorena showcased her beautiful and flawless line of jewelry. Lolo Jewellry is created for women who have an appreciation for versatility, exclusivity, and timeless beauty. 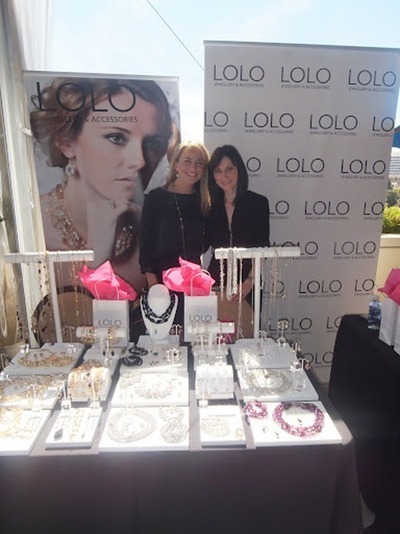 Guests were able to take a piece of Lolo jewelry home with them to enjoy for that next special occasion. 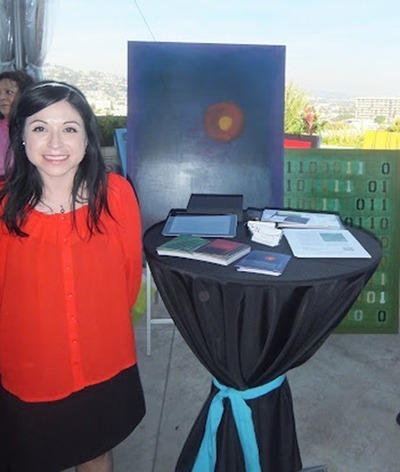 Marissa Denise, is a unique artists that works mostly on large abstract color field oil paintings. Using late 20th century post-war painting techniques, designs by Marissa Denise, are in a league of their own. A true artist, she aims to depict personalized romantic theories and uses color to generate a vague suggestion of human emotion. Guests were able to get a gift certificate for a complimentary oil canvas painting and consultation. 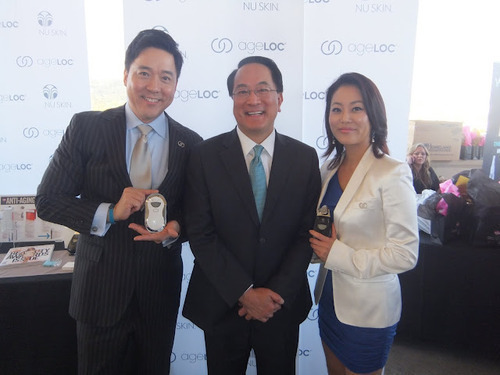 Nu Skin Enterprises Inc., is a global leader in anti-aging technologies for skin care and nutritional products, was a very pleasant surprise to an already breathtaking gifting suite. 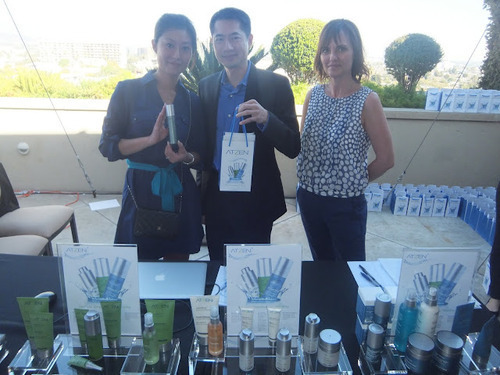 This company showcased its new Galvanic Body Spa at The Secret Room gifting suite today. The Galvanic Body Spa helps to minimize the appearance of cellulite for a slimmer, smoother, and firmer looking appearance. I’d have to say this is a best kept secret that was unwrapped just in time for the Academy Awards. A must need accessory for every woman, a good set of tweezers. 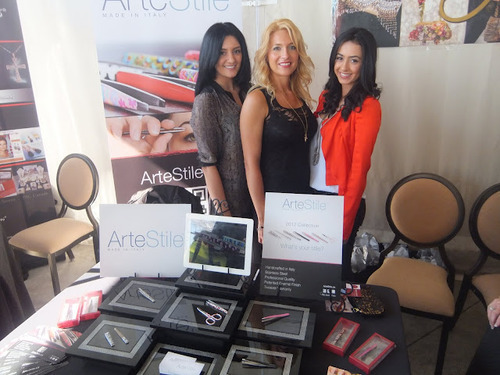 ArteStile, is the perfect personalized set of tweezers. They are handcrafted in Italy professional quality, stainless steel, patented enamel finished tweezers. Each set of tweezers has a slant designed to ease the pain that women sometime experience when missing the right spot. To achieve the perfect plucked and shaped eyebrows, try ArteStile tweezers and obtain ‘the look’ in half the time and pain free. Run the range in a pair of Loudmouth pants. 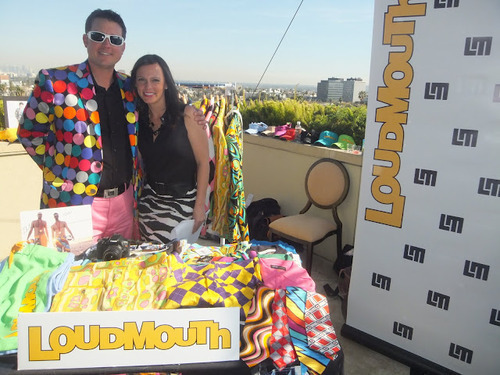 Loud Mouth Golf Pants turns any dull occasion into an exciting and fun extravaganza! Loud mouth is composed of funky colors, patterns, skirts, shorts, blazers, pants and more-that are sure to make you stand out from the crowd and turn your ordinary adventure into an extraordinary experience. 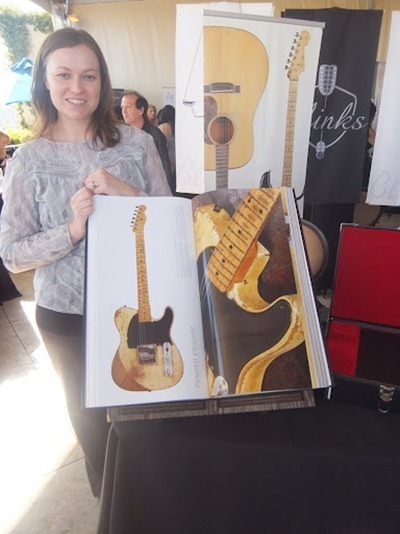 Gibson Guitar once again made its staple at a gifting suite. Gibson Guitar created the ultimate coffee table book which incorporates the history of guitars. Weighing over 40 pounds, this book gives readersa behind the scenes look at striking that perfect cord. 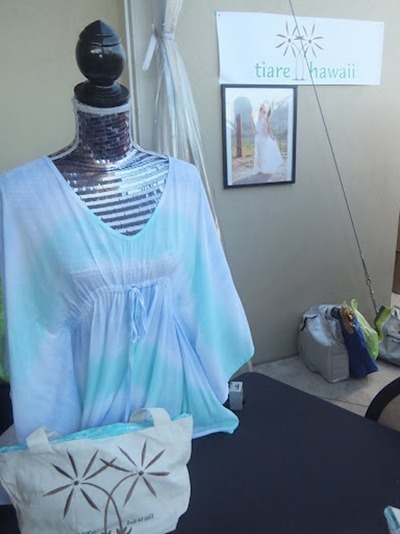 Right off of the sunny breezy coasts in Hawaii, comes a refreshing clothing line called Tiare Hawaii. This company is composed of women’s wear with a beach twists. Cute day dresses that can easily transform into a night time piece is what Tiare Hawaii had on display. Every attendee was able to pick out a piece from this stunning collection to take home. The Neocell Corporation is dedicated to providing premium collagen peptide-based dietary supplements for skin, connective tissue and joint health for consumers worldwide. Those in attendance were able to test out a few products based on their individual needs, and also try out the delicious gummy vitamins on display. Jock Soap is developed exclusively for guys. This line of products is composed of face care, body care, hair care as well as fragrance. All of these products are geared towards men, and even go the extra step as to letting guys know which products the ladies love. The prime directive over at Jock Soap is to fuse traditional ingredients with the latest technology to create innovative formulations that feel good and work great. Topricin is a line of pain relief products that the whole family can use. Here at The Secret Room Gifting Suite, Topricin displayed three items from its collection. One primarily for your feet-to ease any pain you may experience on your feet, an overall cream-which is designated to soothe joints overall, and lastly a cream that can be used for children. With everyone on their feet and running around during Academy Awards weekend, this cream will prove to help everyone out. 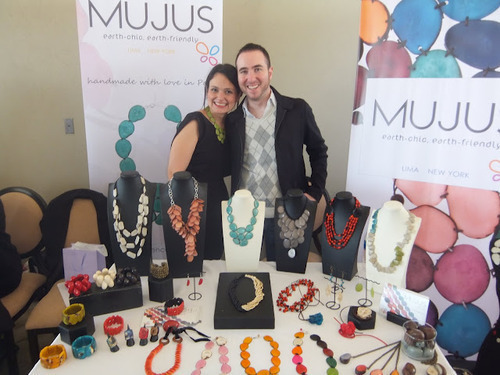 Mujus is complete organinc jewelry and accessories, this company uses biodegradable materials and fibers to create contemporary and colorful designs that stand out for their elegance and beauty. The Mujus table had a nice display of necklaces, rings, bracelets, and even seasonal pieces in a variety of colors. VIPs were able to take a piece of this colorful, enchanting jewelry home with them. Hylunia is the leader in the skincare industry for safe and healthy anti-aging products. Since 1988 this company has been committed to staying ‘green’, and provides organic, pure and safe skincare products. 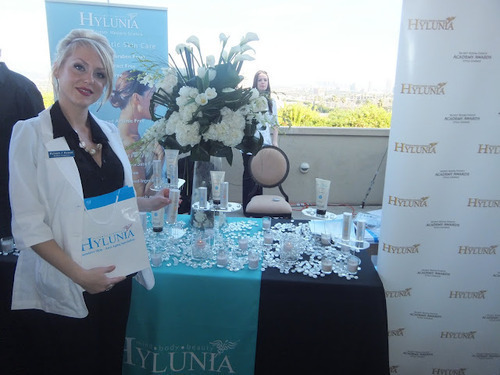 Hylunia gave all in attendance the opportunity to try these products and take a few products home. My personal favorite was the ‘Healing & Restoring Cream’ lightly lined with lavender extracts, this cream served as a good, deep penetrating lotion that calms the skin. 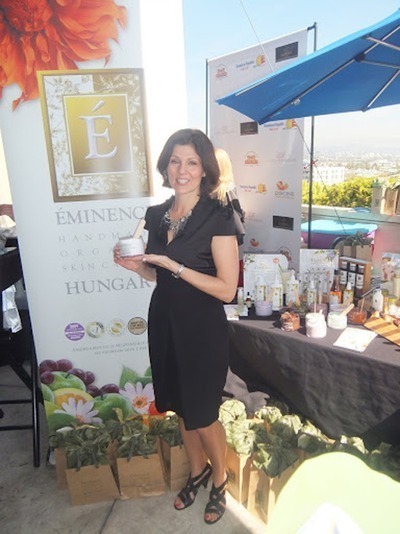 Since 1958 Eminence has proven to be the handmade organic skin care of Hungary. It is the most unique and effective line of natural skin care products around. Majority of the products come in concentrated formulas, after adding a few drops of water the treatments are good to go. Not only do these products look great and smell fantastic, but they are extremely effective in treating several skin concerns. Turtle Island is an all-inclusive, private island with home to only 14 couples at a time. The breathtaking panoramas of the renowned Blue Lagoon and neighboring Islands can be seen from your villa. 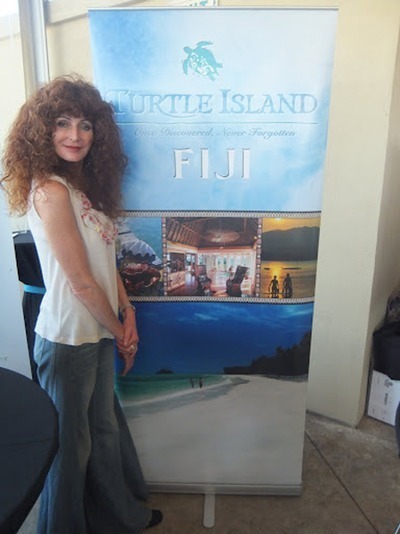 Complete with gorgeous scenery and beautiful scents cause you to relax and indulge in Turtle Island is a place you have to put on your list to visit. Guests were able to enjoy the special discounted rates they were giving in lieu of the Academy Awards. Guests were overwhelmed with excitement and not to mention overwhelmed with the gift bags. Additional sponsors for this event included: Blinks Jewelry, Dominican Republic Representatives, Wakatobi Dive Resort, World’s Best Cat Litter, Cat Power Tower, Sleep Couture, Suboo, Dallas Prince Designs, Renuatum, and many more. 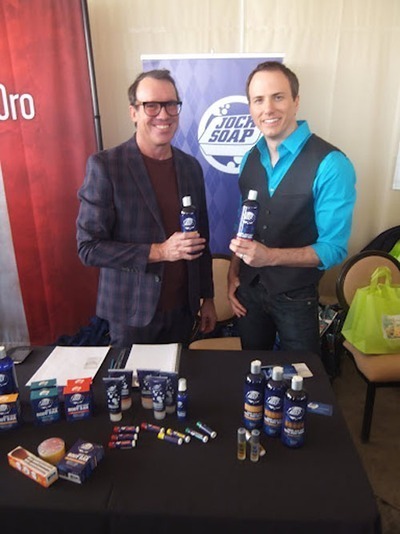 The Secret Room Gifting Suite was one for the charts. Put together perfectly on the rooftop of the L’Ermitage Hotel this suite provided the perfect ‘swag bag complete with facials, spa treatments, jewelry, as well as plenty of other trinkets.